February 26, 2017 May 15, 2018 ~ Steve N.
I have mixed feelings about McDonald’s. I’m not a fan of their need to super-process everything they sell. Much of it is more science experiment than food, but I am by no means anti-McDonald’s. I love the fries. It’s an occasional snack for our family if we’re out and about and craving something hot. We’ll head into the nearest Micky D’s, order two large fries, and go to town on those bad boys, happily dipping those crispy fries in lots of ketchup. In my opinion, McDonald’s fries are to this day the standard by which all other fast food fries are to be judged. I’m also a huge fan of the hash browns. McDonald’s has a way with potatoes, and the hash browns are no exception. Tender chopped potatoes surrounded by a crispy, crunchy, salty, sheath. Yum. 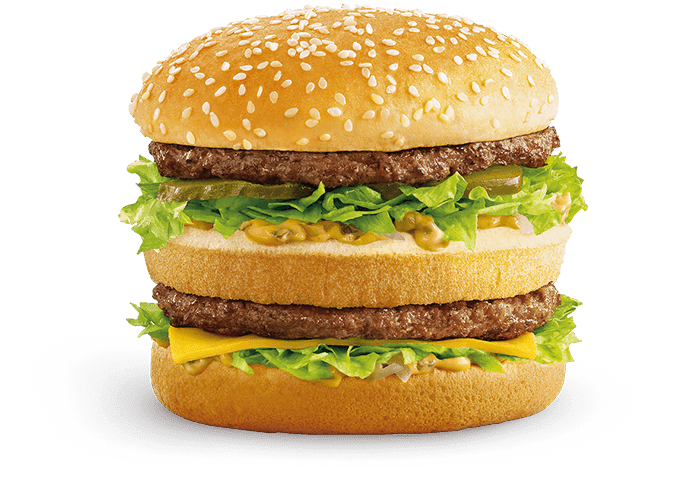 The Big Mac is another McDonald’s triumph and is arguably the most famous burger on the planet. It’s sold in over 100 countries and McDonald’s claims to sell seven Big Macs a second. That’s no small feat. The Big Mac breaks a couple of burger rules for me, the most important being the small amount of beef relative to the rest of the sandwich. But I like the Big Mac and will eat one on rare occasions. In spite of the lack of beef, McDonald’s sells a lot of them, and that’s because they are tasty. 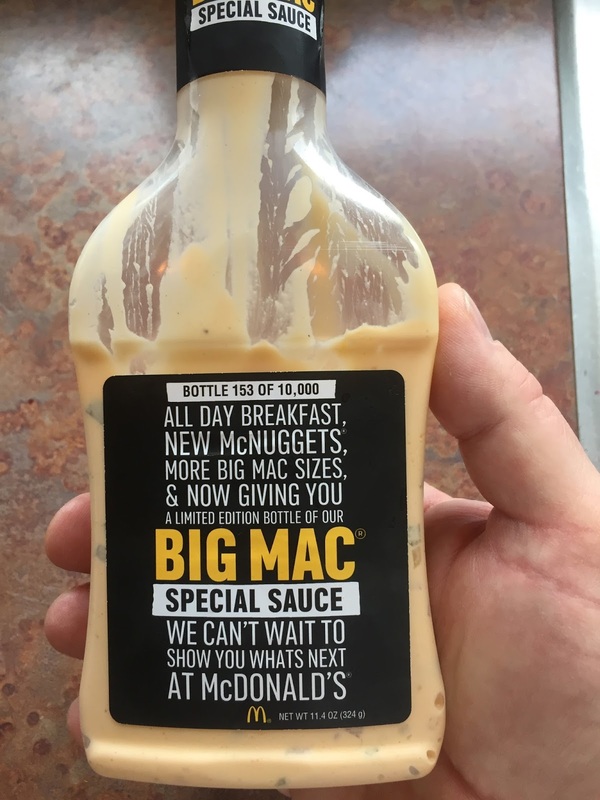 And there’s no doubt the key to the Big Mac’s deliciousness is the special sauce. There’re a lot of recipes on the internet that attempt to duplicate a Big Mac. But ultimately, they all come down to the special sauce. Duplicating it is critical to making a Big Mac at home. Well, I have no such issue, because I’m holding the real McCoy in my burger stained hands! There was no debate in my mind what I’d do with Daniel’s gift. I’d set out make my version of a Big Mac. My goal was not to improve upon it but to make a burger at home that was as close as possible to the real deal. For whatever reason, the top bun in my burger appears to dwarf the middle and bottom buns, but trust me, they’re all the same size. 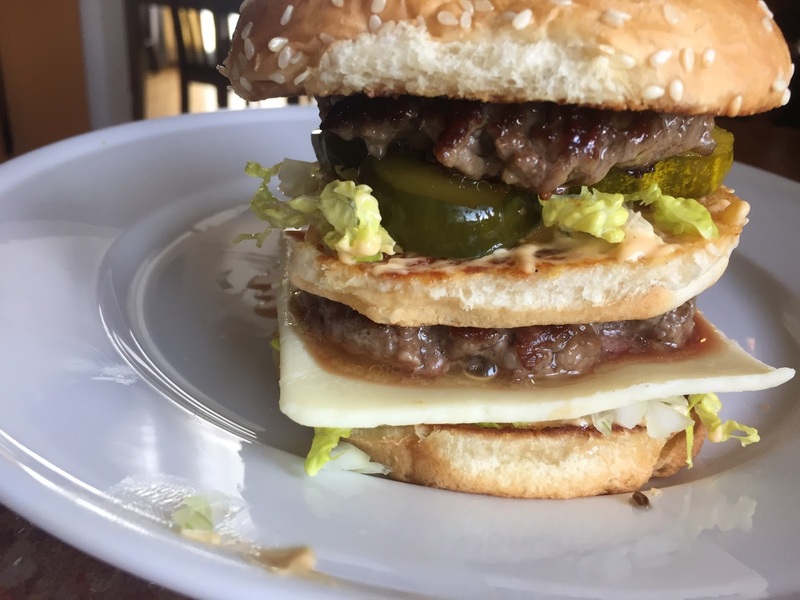 You can see I used white American cheese, instead of orange (which is entirely inconsequential), but other than that, my Big Mac is a solid facsimile of a McDonald’s Big Mac. And finally, the sesame seeded top bun. Salty, very salty. And vinegary, and tangy. I generously salted the beef patties, which I always do when making burgers, but I think that was a mistake. The Mickey D’s special sauce is very salty on its own, and I probably should’ve cooked the burgers sans salt. Also, my pickle slices are thick, and they added a lot of vinegary tanginess, which also isn’t needed because the special sauce is very tangy (and also has chopped pickles in it). Next time I’d use thinly sliced, milder flavored pickles. Otherwise, it was delicious, and while it wouldn’t fool you into thinking you were eating a Big Mac, it did taste close enough to the original that I’m satisfied with the experiment. Now, I have to figure out what to do with the 1/3 bottle of special sauce I have left.